Like its mirror-image neighbour, Tawantok Beach Villa 2 is absolute beachfront. Next to the beach is the 11-metre private swimming pool, with a large alfresco dining sala at one end, looking out to sea. Behind the sala, set in the well-maintained gardens, is the glass-fronted living, dining and kitchen pavilion. To the other side of the garden is the palatial master suite with an unobstructed sea view. The four guest bedrooms are arranged in a pair of pavilions just behind the master suite and living pavilions, each with its own furnished veranda. Alongside the tennis court, which is shared by both villas, is parking space for two cars and staff accommodation with back-of-house services. The social heart of Tawantok Beach Villa 2 is the bright living and dining pavilion, with its huge rustic wooden table, large comfortable sofas facing a wall-mounted TV screen and broad glass doors opening onto the garden and sea views from two sides. Above the dining area, under the eaves of the traditional Thai peaked roof, and reached via a spiral staircase, is a multi-purpose mezzanine room that could be designated as a children’s play area or massage room. The villa’s 11-metre infinity-edge pool has a spacious deck furnished with sunbeds for admiring the wide sea view while topping up your tan. The beautifully maintained garden is ornamented with richly scented frangipani trees and pots of brilliant bougainvillea and royal lotuses, and alfresco dining is a treat in the beachside sala, just a few steps away. The master suite at this luxury Lipa Noi villa is huge, its bright airy bedroom boasting panoramic views of the ocean. Behind the sleeping area is a spacious living and dressing room with comfortable chairs, a large TV and a capacious wardrobe with safe. To one side of this space is the large bathroom, with rain shower, large vanity and freestanding bathtub. Bathers can open the frosted glass doors next to their tub to enjoy sea views while they soak. Under the sloping eaves above the master suite is a mezzanine bedroom furnished with a queen-size bed. This room shares the master suite’s bathroom and, together, they are perfect for families. The four guest bedrooms at Tawantok Beach Villa 2 are identical with the exception that three are king-bedded and one has twin beds. Each also has a desk area and an armchair and, outside on the veranda, chairs for enjoying that first coffee of the day. All rooms have ensuite bathrooms with rain shower, twin vanities and a large wardrobe with safe. All Tawantok Beach Villa 2’s bedrooms are fully air-conditioned. Lipa Noi Beach, west coast Koh Samui, Thailand. 14 people: 10 adults and 4 kids (five bedrooms: one king-bedded master suite, which has a mezzanine fitted with a queen-size bed; three ensuite bedrooms with king-sized beds; and one bedroom with twin beds convertible to king-size. Two extra beds may be set-up for two kids at no extra charge.). Living and dining room, children’s play room, open-air dining sala, study (in master suite). Beachside infinity-edge pool 11m x 4.5 x 1.7m. Villa manager; chef; housekeeping and service staff; security. Additional staff (nanny/babysitter, masseuse, yoga/muay Thai/tennis instructor) available on request for extra charge. Tawantok Beach Villa 2’s chef is expert at both Thai food and Western cuisines. Guest requests are accommodated as far as possible (including special diets). Groceries are charged 20% handling fee which is subject to 7% government tax. Complimentary WiFi in all areas, reaching onto the beach. Complimentary mobile phone for guest use (local calls). Printer. Tennis court and equipment; beach volleyball net; beach football nets and equipment; satellite TV; DVD player and film library; Apple TV 4K; small library in master suite; table tennis; kayak; stand-up paddleboard. For parties, magicians, Thai dancers, cabaret acts and more can be arranged. Tawantok Beach Villa 2 is exceptionally well equipped for families. Facilities include toys; pool toys; children’s DVDs and books; high chairs; baby cots; baby monitor and bottle steriliser. 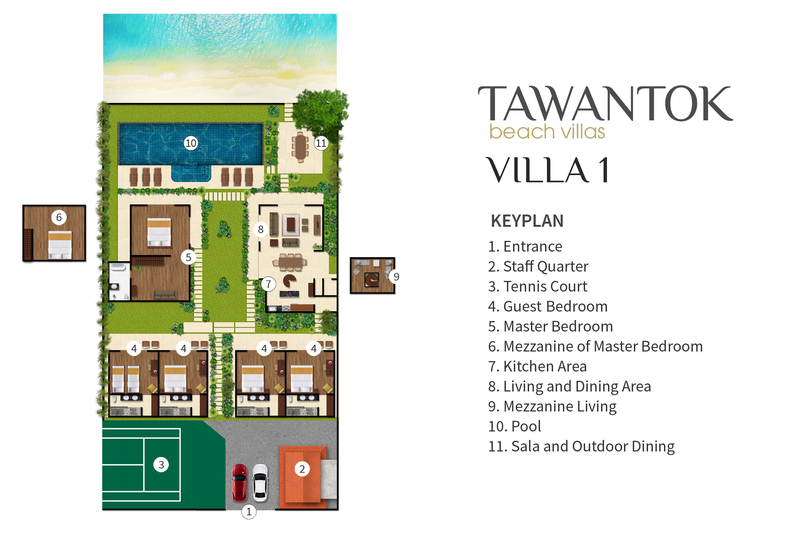 Events for up to 30 guests can be arranged at Tawantok Beach Villas - Villa 1 with prior notice (event fee applies). Complimentary one round-trip airport transfer; car or minibus hire and taxi pick-ups can easily be arranged by the villa manager (on guest account). Parking space for two cars. Barbecue; safes in 5 bedrooms.